One Nursing School Session Down, 13 to go! My nursing school has 8 week sessions for classes. This is different for me since I am used to the traditional 16 week semesters. This week, I finished my first session! I received A’s in all of my classes! You know you set yourself up great (and worked really hard) for a final when you only need a 15% on it to pass the class and an 82% to keep your A. This is a huge accomplishment since I have a lot of factors that should cause me not to succeed. Michael has been gone for 5.5 out of the last 8 weeks! We are so proud of him though with all of the incredible missions he has been a part of making happen! Check out a few of the amazing things his base and him have been up to during this time! -Aided in multiple cross country training missions. -Helped Evacuees from the Caribbean during Hurricane Irma. Provided many missions of bringing medical equipment, personnel, food, water, and supplies to those affected by Hurricane Harvey, Hurricane Irma, Hurricane Maria, Fires, and Puerto Rico. Michael and the crews brought home hundreds of troops from the Middle East so families could be reunited. Brought Emergency Response Equipment back to their home units after they were not needed in Florida for disaster relief anymore. Michael was gone for my finals week. That made studying a little more challenging. I am grateful for my Mom being able to watch the kids as I was at school when Michael was away at work. My Mom took a little time off from everything as she continues to heal from her surgery. She is doing well though. 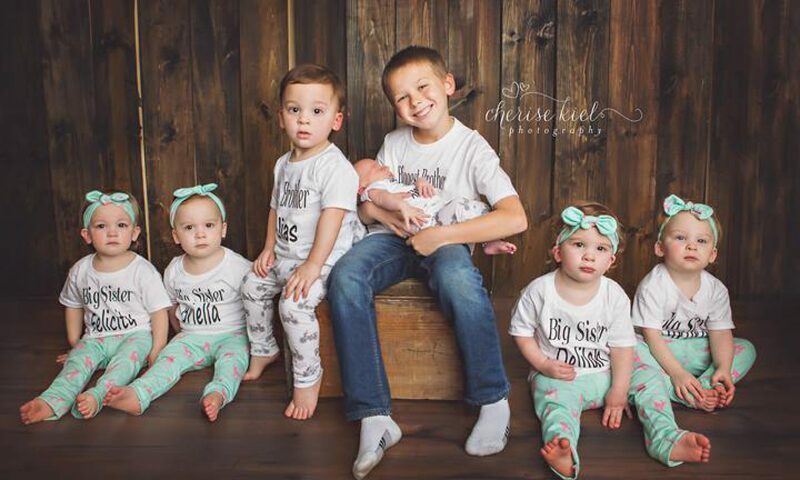 In addition to all of these things, I had to make sure all 7 people were well taken care of in every way, Conner is playing in 2 sports, the quints have multiple sports, and more keeping us busy. Michael and I had some big career decisions to make. After many prayers, talks, and finding guidance from others. We have finally made the stressful decisions and are excited to implement steps to provide the best future for our family. The next few years will be extra challenging and busy but I know we we will continue to thrive and make it. We will announce things at a later date. We were told very recently by someone that we are extremely selfish and need to think of our children before ourselves. I was told I am selfish for returning to nursing school. However, I have given up my house, my body, my military career, my nursing school before (hence why I am restarting), and more to dedicate myself and ensure the best outcome for all of my children. Yes, school is stressful. However, it is a good stress that I work on mostly when my children are sleeping. Not loosing who I am as I person entirely mentally makes me a better Mother. Not to mention, our family size is expensive my degree will continue to allow us to provide an even more fabulous life for our little ones. By completing my degree and following my dream of caring for others, I also show my children what a true role model encompasses. Michael was told he was selfish for continuing his military career. Getting out is not an option it is who we are as people and we have a commitment. We want to give back to other and protect what matters most to us. Financially, it is the best fit for us right now as I return to school. Michael is getting closer to a great retirement everyday. I have never complained about him being gone and the workload shifting to just me. It all always works out. The person who told us this is not inconvenienced by our decisions. So, I do not understand why they feel the need that they have a say…other than it is them feeling inadequate. I have heard so many times I will reach burnout but that is not in our cards. We just work harder, have faith in each other, and faith in God. We do not have time or energy for any naysayers. We have people to help, a family to care for, and a positive spirit that is unstoppable. Sorry, not sorry. Roxi, I’m taking a break from social media so that explains the absence.. so glad to get to follow your family via blog. 🙂 As far as the “extremely selfish” comment… what?? Does this person live on the same planet as the rest of us? My twin sister and I were just talking the other day how you’re the funnest multiples family to follow because you clearly don’t do it for fame or recognition. We follow other multiple families that get lots of handouts and tons of date nights/breaks from the kids, which isn’t reality for most. It is very refreshing to see this is not the case with you! You should never feel guilty for furthering your education or doing things for yourself, because we all know at the end of the day they’re way more for the kids than they are for you! Keep up the excellent work! Previous PostPrevious Family Fun at the Pumpkin Patch and More- Day 1 of Michael’s Leave!